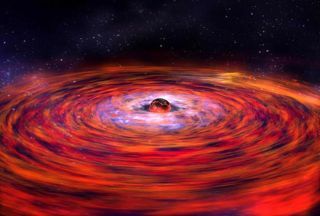 An artist depicts a disk of hot gas whipping around a neutron star. The gas in the inner part of the disk whirls around so fast that it experiences effects predicted by Einstein's theories of relativity. Einstein'spredicted warping of space-time has been discovered around neutron stars, themost dense observable matter in the universe. The warpingshows up as smeared lines of iron gas whipping around the stars, University of Michigan and NASA astronomers say. The finding also indicates a size limitfor the celestial objects.?? The samedistortions have been spotted around black holes and even aroundEarth, so while the finding may not be a surprise, it is significant foranswering basic questions of physics, said study team member SudipBhattacharyya of NASA?s Goddard Space Flight Center in Greenbelt, Md. and theUniversity of Maryland, College Park. ?Thisis fundamental physics,? Bhattacharyya said. ?There could be exotickinds of particles or states of matter, such as quark matter, in the centers ofneutron stars, but it?s impossible to create them in the lab. The only way tofind out is to understand neutron stars.? Neutronstars can pack more than a sun's worth of material into a city-sizedsphere. A few cups of neutron-star stuff would outweigh Mount Everest.Astronomers use these collapsedstars as natural laboratories to study how tightly matter can be crammedunder the most extreme pressures nature can offer. To evenbegin to address the mystery of what lies within these dying stars, scientistsmust accurately and precisely measure their diameters and masses. In twoconcurrent studies, astronomers used the European Space Agency?s XMM-NewtonX-ray Observatory and the Japanese/NASA Suzaku X-ray to survey threeneutron-star binaries: Serpens X-1, GX 349+2 and 4U 1820-30. They also studiedthe spectral lines from hot iron atoms that whirl around in a disk just beyondthe neutron stars' surfaces at speeds reaching 40 percent light speed. Normally,the measured spectral line for the superheated iron atoms would show up as asymmetrical peak. However, their results showed a skewed peak that wasindicative of distortion due to relativistic effects. The extremely fast motionof the gas (and the related powerfulgravity), they say, causes the line to smear, shifting it to longerwavelengths. Themeasurements allowed them to determine maximum star size. ?We're seeingthe gas whipping around just outside the neutron star's surface,? saidXMM-Newton team member Edward Cackett of the University of Michigan. ?And since the inner part of the disk obviously can't orbit any closer than theneutron star's surface, these measurements give us a maximum size of theneutron star's diameter.? He said theneutron stars can be no larger than about 20.5 miles (33 kilometers) across. TheXMM-Newton paper was published in the Aug. 1 issue of Astrophysical JournalLetters. The other paper has been submitted for publication in the samejournal.